Top Ad Networks for publishers are characterized by their track records and how satisfied publishers are working with them. There are hundreds of Ad Networks for publishers in every corner of the globe. The number of Ad networks for publishers has skyrocketed in the past ten years. These Ad Networks have however used different Ad formats and different payment and pricing models with specific requirements for publishers. The differences that exist among these Ad networks makes it difficult for some publishers to be accepted. In most cases, publishers are rejected because they do not meet the requirements of those Ad Networks or simply apply to the wrong Ad networks. Understanding these problems, we decided to review the top Ad networks for publishers including their pricing models and other valuable information to help you make the right choices when choosing an Ad network to monetize your traffic. I guess it won’t surprise anyone that Google AdSense makes number one on our list of Ad Network for publishers. Google AdSense is known to be the largest and probably the best Ad Network for publishers around the world. With a massive number of publishers, the Ad Network is run and managed by Google which uses pay per click (PPC) and per-Impression (CPM) pricing model to pay publishers. Google Adsense has almost all Ad types which enable publishers to create Display Ads, Matched content Ads, Responsive Ads, Link rich Unit, Text Ads, Video Ads all in a customizable format and also responsive. Your site should comply with content language. optimize your content for SEO. 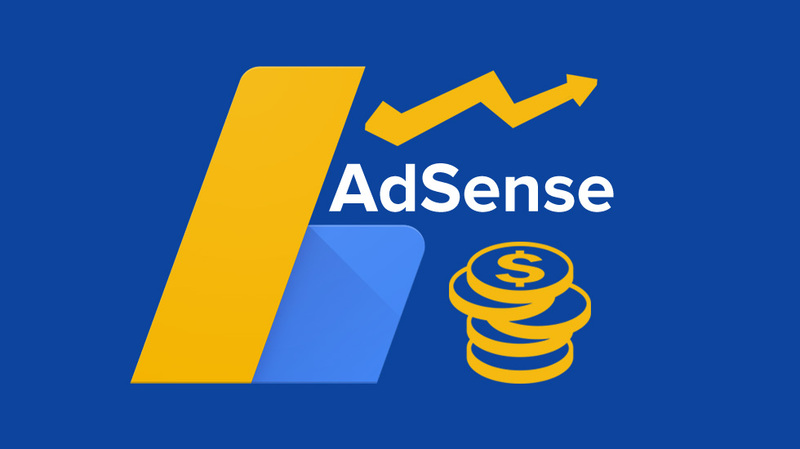 Want to read more on how to make more money with AdSense, follow these step by step Google AdSense best practices. Google Adsense threshold is $100 for the first withdrawal. Before your first payment, You will have to Add your bank account and verify your address before your first payment will be deposited once you reach the threshold. 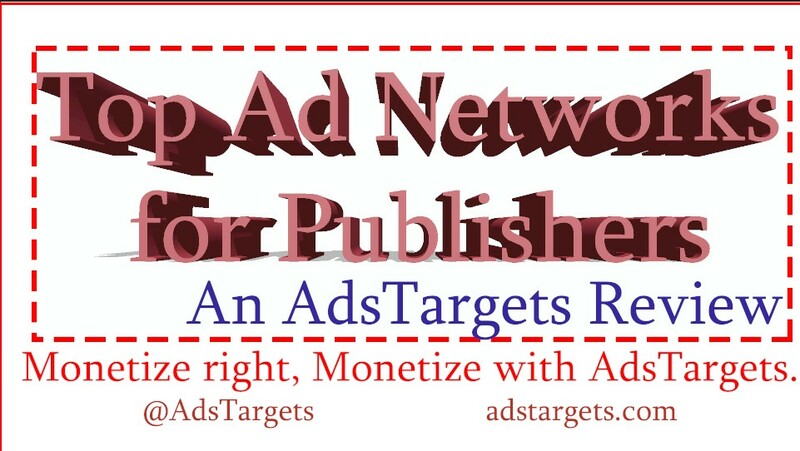 AdsTargets Ad Network is a CPC and CPM online advertising technology for advertisers and Publishers. The aim of the Ad Network is to become the most desired Ad network for advertisers and publishers. AdsTargets offers one of the best advertising and monetizing technologies in the market. It offers both cost per click (CPC) also known as pay per click (PPC), CPM = cost per 1000 impressions and their ads are servers across desktop and mobile devices globally. Advertiser and publishers can advertise and monetize using their vast ad units such as Banner Ads, Text Ads, Interstitial Ads also known as full-screen Ads, Retarget Ads, and In-App Ads. AdsTargets just like other Top Ad Networks for publishers has few requirements for qualified publishers. Don’t be scared its anything to worry about! AdsTargets require publishers applying to monetize their website or blog to have reasonable content and should be updated regularly. Secondary, As a publisher, your content should not have or include content that is related to violence, drugs, racism and any form of illegal activities and discrimination. Refer to Publisher terms during application for more details. Website and blog with such content will not be approved by AdsTargets. AdsTargets Accept members from all over the world and currently in eighty-seven countries. Adstargets was created after several years of experimental studies done by interviewing top advertisers and publishers around the world. The founder took the complaints from both sides and worked tirelessly to create a platform that could finally offer the desired value for advertisers budget while at the same time making sure publishers are paid the maximum earning commissions they deserve. AdsTargets Payment threshold is only $35. AdsTargets pay publishers through Paypal and wire transfers. 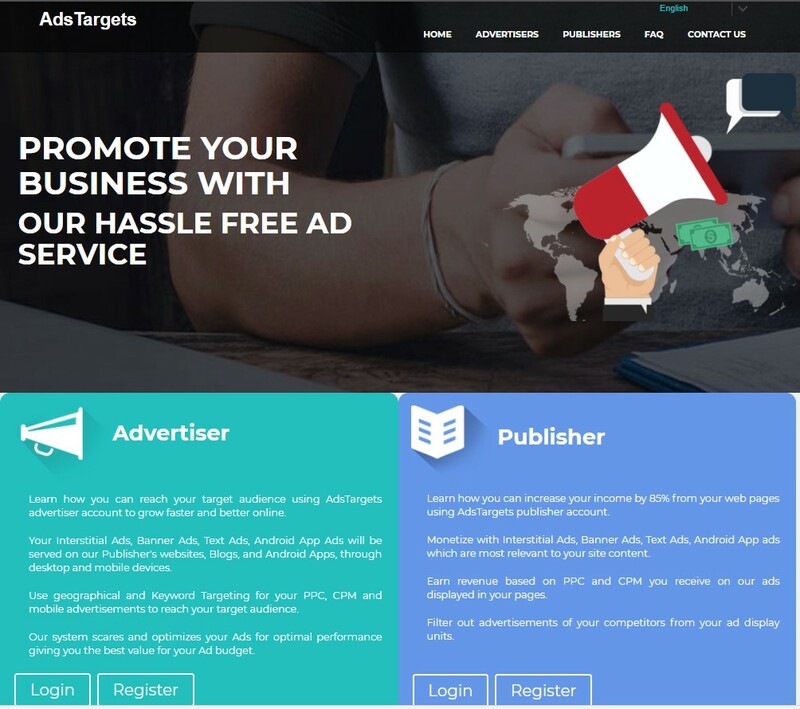 AdsTargets advertising technology is capable of automatically scaling and optimizing advertisers Ads to reach the right people only while they also pay over 80% commission of the Advertising revenue to publishers. This makes AdsTarget one of the top ad networks for publishers globally. Even though they are new to the market. Start Monetizing at AdsTargets Today! AdMob by Google made our list of Top Ad Networks for Publishers. This is because AdMob is simply the biggest App monetizing Ad network in the market currently. AdMob is own by Google and covers the largest share of In-App advertising. Ad run Native Ads, Video Ads, Interstitials full page Ads, and Banner Ads. Admob is available for IOS, Android Unity, and Cocos applications. Now that you understand what Admob is all about, here are the few benefits you will get as an App developer willing to make money monetizing with them. When it comes to making the most money with Admod, the secret is knowing which Ads units are making you the most money. Admob claim the Native Ads and the video Ads. you will have that in mind when once you are ready to start monetizing your Apps. Media.net is number four on our list of top ad networks for publishers. No doubt the company has taken a large share of the advertising market. media.net has over 500,000 publishers websites, more than 70 million paid clicks each month, they have an estimated over 87 billion display Ads impressions per month according to their About page as at 10th 08 2018. With the above figures, its fair to say Media.net is massive and obviously in the top five list of top ad networks for publishers. Media.net was created to Run Yahoo and Bing Ads and was very successful doing that, some their top publishers include Hearst, Meredith, Forbes, Yahoo, MSN, Kiplinger, Reuters, The Street, Ziff Davis, NY Daily News and many more giant publishers in the advertising market. Media.net net is known for contextual ads, Native Ads which they run on desktop and mobile devices. They also run a lot of banner Ads and Interstitials also known as full-screen Ads. This brought us to the conclusion of the top ad networks for publishers. Media.net payment threshold is $100. They pay their publishers through PayPal and wire transfers. We know this list might short when compared with a similar post, the reason is that we don’t just want to create a list of affiliate list of Ad networks like most others do, instead, we focus on bringing you the best list of ad networks for publishers based on their track records. we hope you find it useful and also tell us what you think about this post in the comment section. The online Ad network can be defined as a digital platform, created with the sole purpose of serving Ads to registered publishers. Those registered publishers are websites and Blog owners willing to earn some revenue from displaying Ads. It’s a simple concept that is aimed at connecting the advertiser to bloggers and website owners willing to show those ads on their web pages. In other words, “Ad Network” facilitate the connection between the advertisers willing to buy available Ad spaces (Inventory) from a group of publishers in different geographical locations across various categories (Niche). Since the begging of internet marketing which includes online advertising in the early 90s, Ad Networks use to serve as intermediaries between advertisers and publishers. The technology has advanced today with many functions that allow for more advertising optimization and targeting tools to reach more target audience. 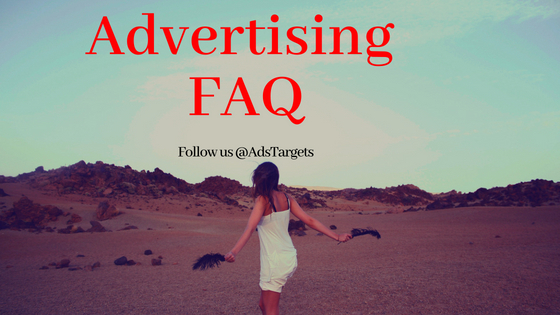 However, There are always two important parts or groups on every Ad network which are the Advertisers and Publishers. The Advertisers are business or individuals willing to promote their products or services online with the hope of getting more traffic and increasing their sales, on the other hand, Publishers are individuals willing to display Ads from particular those advertising platforms to earn some income through their traffic’s clicks and impressions. The advertisers are often the businesses or individuals, they pay to them, create ads and submit those ads for approval by the Ad network admin. once the Ads are approved, they are shared on the publisher’s web pages. Ads sharing follows a process and guidelines based on the preference of the publisher. While creating Ads from the Adnetwork inventory, they select specific Ad based on their location, keywords, and niche. To avoid confusion, these ad networks include only online advertising and not the traditional advertising media that include television, printed media and radio. The Pricing model mostly used by Ad networks is CPM, CPC or PPC, CPA etc. AdNetwork like AdsTargets offers publishers the ability to create different Ad units like Banner Ads, Text Ads, Interstitial Ads, In App-Ads. Additionally, publishers can choose their preferred device to publish their Ads. This is one of the most asked questions by newbies in the advertising industry. To clear the confusion, we explain in simple terms what is an Ad server and what is an Ad Network below. What is An Ad server? In simple terms, it is simply an inventory tracking, monitoring and managing advertising technology used by both Advertisers, publishers and Ad Networks to run and give specific accounts on Advertising campaigns. This is further categorized into two distinct types based on their users. The first one is “First-party Ad server which is mostly used by publishers (A publisher Ad server) while the third party ad server is used by advertisers (An advertiser Ad server). Another term that is widely used is the SSP “Supply-side platform”. This is also a similar technology that offers almost all the functions but a bit different in accessing the inventory and delivery method of distributing Ads which makes it different from the previous two. For more on Ad servers, see the video below. 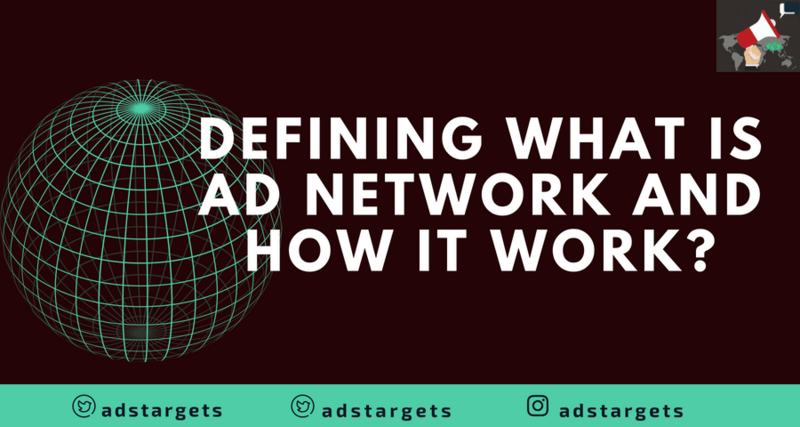 What is an Ad Network? This is another form of advertising technology but unlike ad server, this technology is mostly used for the management of multiple advertising campaigns which store creatives use during transactions of media purchases between the publisher and advertisers. the next complications after understanding Ad servers and Ad Networks, one will ask how do they work which takes us to the next level. 3. How Does an Ad Network Work? Just to refresh your memory, An Ad Network work by collecting and listing all the available inventory from publishers and sell them to potential advertisers willing to pay a premium price for them in form of PPC, CPA or CPM. An ad network collects a massive number of publishers to deliver the required amount of inventory to the potential advertisers on a premium price or auction basis. The Advertisers uses the Ad Networks campaign management platform to set up Ads which are then automatically distributed to the publisher’s available inventory. These online advertising solutions offers advertisers the flexibility to create multiple campaigns and consolidate the reporting metrics on the campaign performance. Also, the advertisers set have the possibilities to set up their campaigns based on their desired prices per clicks, impressions and per action. Targeting through demographics, location, keywords, and budgets are all features offered by Ad Networks to advertisers. Once The Ad networks approve advertisers Ads, Advertisers are allowed to change their banners, Text, and targeting as they please. All these Ad management systems are offered within the Advertiser CPanel (Campaign management panel). No time limits or restrictions are placed as the system are managed online 24/7. In the early 90s when there were few online advertisers and publishers, Publishers were fine using only one Ad Network to source their available inventory but as internet marketing business became more massive, they figured using multiple ad networks pays better and that’s why today you see most publishers use various ad networks on their inventory spaces which also forced Ad networks to drop their rates. 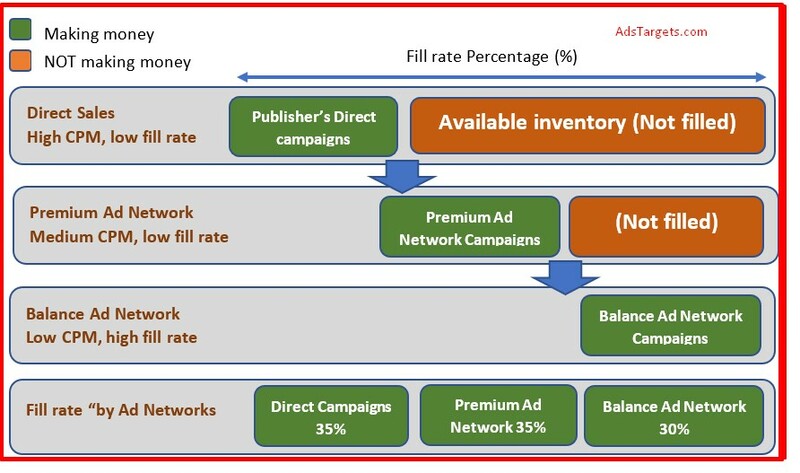 the image below shows the risk associated and rewards when inventory is sold to different ad networks. 4. How Advertisers and Publishers benefit from Ad Networks? There many ways both advertisers and publishers benefit from Ad Networks. Ad networks serve as a bridge that connects the advertisers and publishers together. This makes marketing and economic sense for all parties but let’s discuss them differently. Scalability: Advertisers have the opportunity to buy many inventories at a time through the platform and at the same time, Ad networks provide them with the opportunity to monitor and manage their ad campaigns in a centralized system. Campaign management: It helps advertisers save a lot of time as they are able to manage multiple ads within one system and not moving on many publishers inventory spaces or web pages. This could be the benefits as they reach more audience within one system. Measurement and Campaign reach: The Advertisers have the ability to manage their measure their campaign performance and adjust them whenever they are pleased. They can adjust their campaigns either by increasing their budgets or targeting. Ad networks also give advertisers the ability to collect data and retarget individuals that visit their web pages. The most beneficial factor for publishers using Ad network is to sell their available inventory which was not easy to be sold directory to advertisers or advertising agencies. Ad networks offer such opportunities and in some cases, they are able to make constant income from selling their inventory to ad networks. 5. What are the Targeting possibilities on Ad Networks? Vertical Ad Networks: These are mostly focused on specific topics such as Technology Ad Network, Business Ad Network, Automotive Ad Network, and Fashion Ad Network etc. Performance and Affiliate Ad Networks: These types primarily use revenue share methods such as the CPC, CPM or CPA pricing models. Inventory-Specific or Specialised Ad Networks: Typically focused on specific types of inventory such as Mobile Apps. Mobile devices, Video, Native Ads etc. The traditional Ad networks offer the advertiser the benefit to buy a package of impressions on a CPM pricing model. Monetize your Traffic with us and increase your income. Start today!! Even though these two have similar functions, and serve almost the same purpose, there are still some differences that exist between them in terms of technology, inventory, clients, Ad optimization functions and targeting. Inventory: SSPs tend to offer real-time bidding (RTB) and buy inventory that is available from the publishers known to be of “lower quality”. While on the other hand, Ad Networks sell their available ad inventory to brands by giving them access to premium and exclusive publishers. Technology: SSPs functions allow only Ad delivery, the combination of SSP/DSP (demand-side platform) can be considered the partner of ad networks. Optimization and Targeting: Ad Networks advertisers are allowed to manually target and optimize their campaigns to reach a specific audience. However, the combination of SSP?DSP uses special machine learning technology. SSPs utilizes programmatic technologies to automatically to optimize ads for publishers, Similarly, DSPs also optimize Ad campaign for various brands while allowing them to target a specific desired audience. As the digital advertising market evolved and became more competitive, Ad Networks have engaged in a battle to maintain a significant amount of their share market. they constantly offer more appealing functionalities to attract more publishers and advertisers. Because of the competition, marketers are constantly searching for one in all solution. It forces the Ad network increasingly offering the same tools as SSPs which is massively closing the gap between them. On the other hand, as SSPs also compete for more publishers, they tend to offer functionalities to attract more premium publishers. At the same time, they offer advertisers the opportunity to buy inventory directly which make them similar to Ad networks. SSPs have evolved a lot as they connect advertisers and publishers (the demand and the supply side). It will be self to say they have evolved towards programmatic direct. This further closes the gap between Ad networks and SSPs. For instance, ad networks’ gradually transcend premium inventory as they integrate programmatic engines that optimize the procured RTB supply. In addition, they are also connecting their own available supply to specific DSPs in a bid to increase fill rates for their portfolio of publishers. Advertising has evolved a lot in general since the first banner Advertising was publishers in the early 90s. We have experienced very high levels of competition among Ad network as they constantly introduce new advertising functionalities. recently, In-App Ads and push notification Ad format have been introduced which has also seen spikes in advertising budgets. the advertising industry will constantly see changes in the near future. We have tried to explain most of what you need to know about Ad Networks and how they work for the benefit of the advertisers and publishers, however, we will continue to update this post to bring you latest information about Ad networks. Feel free to share your experience, observations, and objections in the comment section below.